"Legolas was fair of face beyond the measure of men, and he sang a elven-song in a clear voice as he walked in the morning." 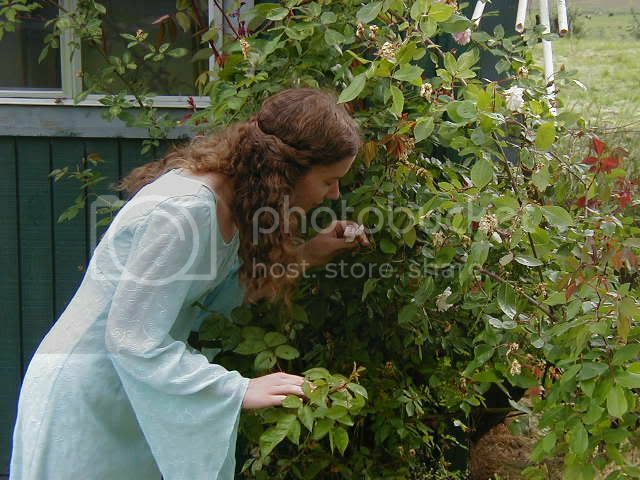 Throughout the recent years following the release of the LOTR films, I have found that with a little research and creativity, one can give handmade dressy clothes a real Elvish flare, without making them look too costumy. My first attempt was a Christmas dress made from Butterick pattern 4018, out of some navy blue panné velvet that was on sale, and trimmed with a beautiful, rather antique looking silver/black braid. I readily admit that the fabric is and looks cheap, but the trim gave it a slightly more sophisticated touch, as did the pattern. I bought both the fabric and trim a few years ago at Joann’s. When I am sewing a special garment, I usually end up giving it a name. 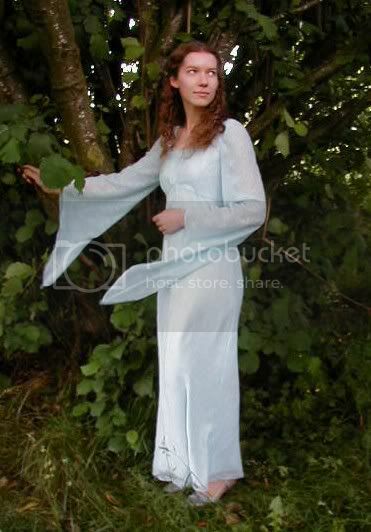 This one ended up as the “Arwen Nightgown,” since I thought it looked a bit like a nightgown. 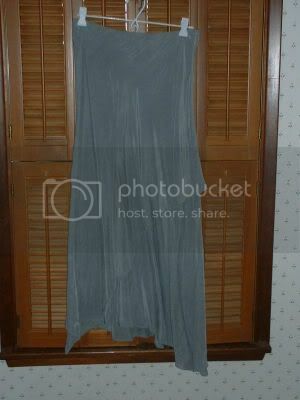 Here is a front and side view of the finished dress. Choose drapey fabrics with a soft hand. Colors should be soft or rich, but should always have an elegant, antique or greyed look to them, never bright or loud which can look cheap and gaudy. Keep prints simple, or use a solid; texture is everything. Look for tone-on-tone designs and embroideries, rich weaves, slubbed silk, sheers, velvets, and suede finishes. Choose shimmery fabrics instead of shiny ones. This gives a more subtle and elegant look. Avoid satin, except in linings and under-layers. 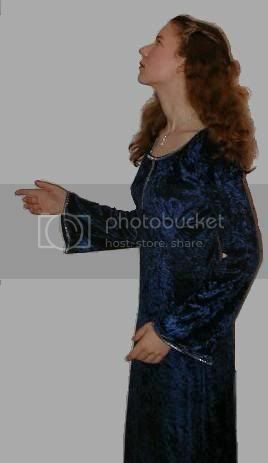 Patterns should have long lines, with relatively few horizontal seams. 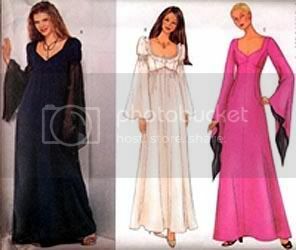 Fitted patterns are better, and side shaping is preferred to darts and princess seams. Still, princess seams and darts may be more flattering to fuller body types, although they do not look as authentic. Light and sheer layers give garments an airy and mysterious quality, characteristic of Elves. Asymetrical hems and any design that imitates flowers and leaves are quite effective. Vines, leaves, and natural shapes are always good. Make sure that metallic trims are somewhat antiqued or dulled; very bright gold and silver look fake and cheap. Please feel free to PM me if you have any questions, comments, or suggestions.